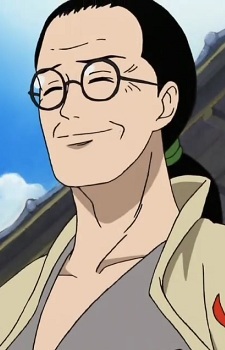 Koushirou is the name of Roronoa Zoro's teacher and Kuina's father. He has his own Dojo near where Zoro grew up and he was the one who trained him. He is typically seen in flashbacks. However, recently, in Chapter 440, he makes a brief appearance when another student of his asked if he was really Roronoa Zoro's teacher. He wished Zoro to go on ahead and fulfill his dream. It is implied he can also cut steel as he follows the method - Swordsman that can cut nothing can also cut steel and anything else they wish, he tries to teach this to Zoro as a child but it isn't until Zoro is 19 before he finally masters it. It is revealed that, at least once in Shimotsuki Village (in a flashback), Koushirou helped the Revolutionaries by providing them food and supplies. He is seen talking with a man with a large face (possibly Emporio Ivankov) after dark, and Monkey D. Dragon even tells his army that they received food by the dojo, while preparing to set sail.